You’d be forgiven for missing it in the blur of press releases and trade show hand-outs – and, let’s face it, most musicians are too focused on music to pay much mind. But slowly, steadily, audio interfaces have been getting a lot better. Talk to the people who make them, and they can tell you what’s happened even in terms of individual components. Next, they’re about to get smarter and more networked. A/D and D/A are the bit that impact the sound, but that networking is some interesting new sauce. AVB boasts both the ability to wire institutions with multiple audio interfaces in different rooms with next-to-null latency. Then, Web app support means you can let your guitarist tweak her headphone mix with her iPad. More on that in a bit. The models: 1248, 8M, 16A. The 1248 is probably what readers here are most interested in: 8×2 balanced TRS analog I/O, four mic ins, two front-panel hi-Z inputs for guitars, two independent headphone outs, S/PDIF digital I/O. The 8M is if you want more inputs (eight analog outs, eight combo mic-line-instrument ins), whereas the 16A is all analog (16 ins, 16 outs, TRS). As is the tradition with MOTU and a handful of rival vendors, these aren’t just “studio” interfaces, spec’ed only for sound engineers. They’re also configured in ways musicians might use in their own work. And, of course, they’re MOTU boxes, so you still get get not only all these mixing features, but standard functionality like word clock I/O (key for video production and the like). Also interesting: that’s class-compliant USB, so you could theoretically connect these to an iPad if you wanted. 8M, for gentlemen and ladies who prefer those extra mic pres. 16A. A is for … analog. And, they’re mixers, with internal DSPs, so you can add modeled analog EQs, compression, and gating in the box without adding latency on the computer. So, that much is familiar. Here’s where things get interesting. AVB is about the ability to combine interfaces via standard Ethernet cabling. You can even get a MOTU switch and connect three to five (or two using the onboard port). Why is that interesting, apart from MOTU selling you more hardware? Well, you can not only daisy-chain interfaces, but do so over long runs – up to 100m between devices. And you can do that even over Ethernet cabling you already have. Once you do, you get up to 128 channels of networked audio with latency of 30 samples – just above half a millisecond – and then you can clock them. 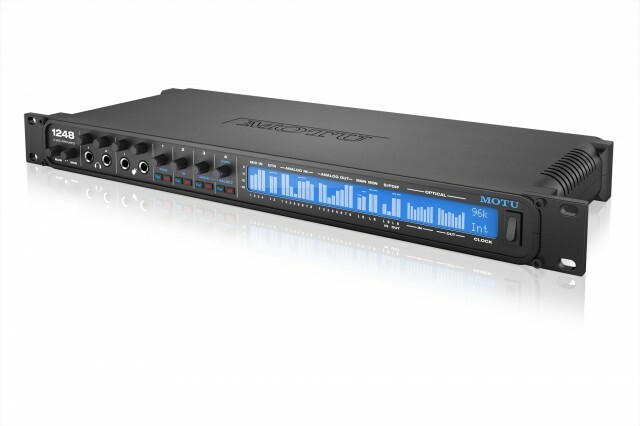 You can also use the MOTU interfaces’ network savvy to control the mixer over the Web. The audio interface itself incorporates its own Web server, accessed via a connected machine on Thunderbolt or USB, or over that Ethernet port, or (with the Ethernet port jacked into a WiFi router), wirelessly. Pricing isn’t astronomical, either. Each unit is US$1495.